SHARING KNOWLEDGE: Caeden Bakker is featured in a new book to help nonfarm kids understand how farmers care for animals and the environment. An Iowa boy helps other kids learn about life on his family’s farm. 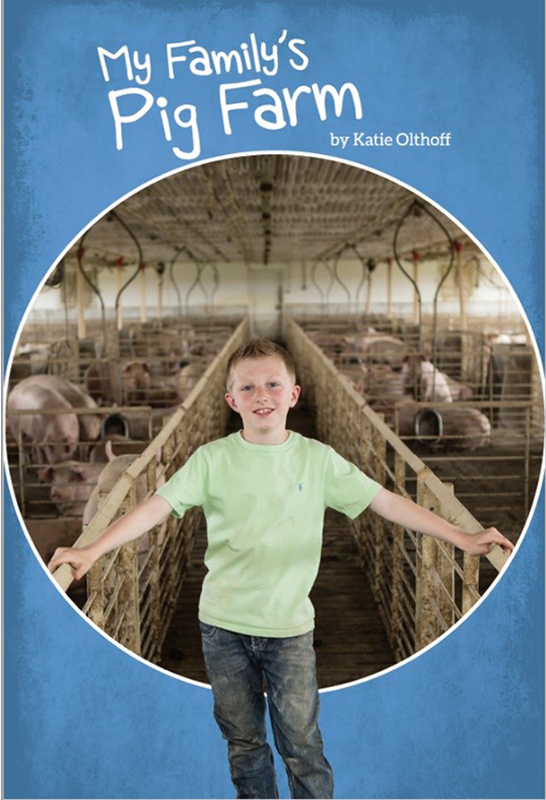 A new nonfiction book by children’s author Katie Olthoff tells the story of raising pigs on a modern Iowa farm. “My Family’s Pig Farm” is available free for students and teachers from the Iowa Agriculture Literacy Foundation. The story follows Caeden, a farm boy in Iowa, whose family raises corn, soybeans and pigs. Caeden takes readers on a tour of the family farm and discusses how they use the manure from the pigs to provide nutrients for growing corn and soybeans. He tells how they keep pigs healthy and use technology to keep pigs comfortable and fed. The book is written at a third-grade reading level and has supplemental text to give additional background information for more advanced readers. The book is the sixth in a series by Olthoff, a former teacher who understands the importance of having high-quality, relevant nonfiction books for students. Iowa Core educational standards require that up to 50% of student reading be informational or nonfiction. Olthoff writes books for the Iowa Agriculture Literacy Foundation to provide nonfiction, ag-based resources to schools. Copies of the book are being made available to all Iowa elementary schools, and additional copies are available on request. The book is a special project of IALF, with financial support from the Iowa Pork Producers and Ag Ventures Alliance. The book has two lesson plan companion resources to help teachers integrate the book into lessons for science lesson, social studies or language arts. The lesson plans are aligned with Iowa Core standards and easily fit into an approved course of study. For more information about this book or other education resources, contact IALF at info@iowaagliteracy.org. He is only 9 years old, but Caeden knows a lot about pigs. In addition to helping his family raise them on their farm in Grundy County in east-central Iowa, he’s traveled with his family as they show the pigs they raise. Now he’s sharing his pig knowledge with other kids in the new book, which IALF is releasing in honor of October Pork Month. The book takes young readers inside the family’s farrowing barn and shows how Caeden and his family take care of pigs. Caeden explains how the family uses technology to monitor temperature in the barn. He takes readers on a step-by-step tour of the farm, showing how pigs are fed, how manure is used as fertilizer to grow crops, how pigs are eventually hauled to market. Readers can see the connection between raising pigs and using Iowa corn and soybeans to feed the pigs. The book also shows the importance of pig farming not only to Iowa, but also to national and international markets, too. Pig farming is important to Caeden’s family. His parents, Jarrod and Shari, are third- and fourth-generation farmers. They grew up raising pigs, and now Caeden and his brother and sister, Cooper and Olivia, are following in their footsteps.